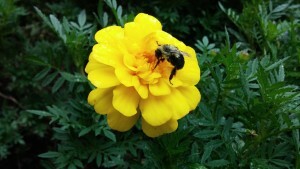 A bee foraging on Marigolds in a client garden. Colony collapse disorder is the phrase used to describe a phenomenon that beekeepers are seeing across the country, in which the majority of a colony’s worker bees suddenly disappear – leaving behind their queen, young, and plenty of food. To put it in perspective; healthy hives typically have a ratio of 2 adults for every sealed brood (offspring). Hives experiencing colony collapse disorder have a ratio of 1 adult for every 2-3 young. Over the 2012-2013 Winter, U.S. beekeepers lost an average of 45% of their hives. After nearly a decade (or more) of research, scientists have determined that colony collapse disorder isn’t caused by just one thing. Instead, it’s a near perfect storm with a multitude of problems impacting bees all at once. Monoculture & Habitat Loss – With the advent of big agriculture and modern farming equipment, farmers everywhere have embraced monoculture – the practice of growing a single crop in large quantities. In theory the practice makes perfect sense because it allows farmers to cost effectively mass produce food to support our country’s growing population. In reality the practice has some major downsides, and at the top of that list is habitat loss. Bees need access to a wide variety of flowers throughout the growing season in order to acquire all the different nutrients they need to stay healthy. It’s difficult to achieve a healthy diet when surrounded by miles of only corn and soybeans. 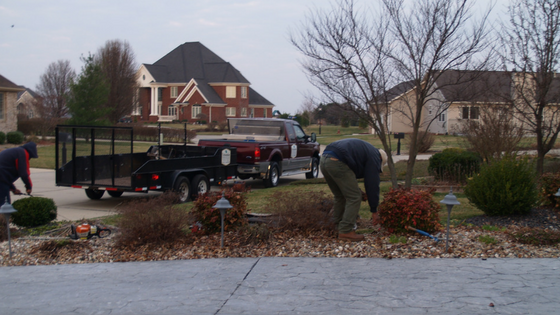 Pesticide Poisoning – Every good landscaper knows that plant diversity is critical to controlling the spread of plant diseases and pests, otherwise one infected plant could lead to the devastation of an entire landscape (or agricultural field). To compensate for the lack of diversity farmers and homeowners use chemicals to control insects and other pests from damaging their plants. The most notorious of these are the neonicotinoids, which have been proven to severely inhibit bees ability to learn, remember, and navigate their environment – all skills critically necessary for the survival of individual bees and the hives that rely on them. Mites & Viruses – Much like humans are prime targets for ticks and flue viruses, bees are also susceptible to pathogens. Of these, the invasive Varroa mite has become a serious problem in recent years. Accidently introduced to the US in the 1980’s, this mite has slowly been spreading from hive to hive across the United States. They’re a problem because the feed on adult worker bees and sealed brood, shortening lifespans and causing physical deformities in the young bees. As if that weren’t enough, the mites are also known to transmit viruses that further weaken the healthy of infected bees. 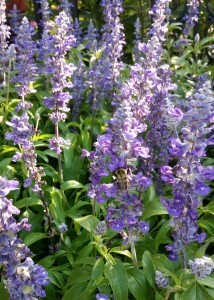 Bee foraging for nectar and pollen on the summer annual: Salvia Victoria Blue. Bees are more than summer noise, they play a critical role in our everyday lives. Pause for a moment and ask yourself: when was the last time you used honey? Or ate an apple? What about almonds? How often do you make recipes that call for tomatoes? Honey bees are directly responsible for pollinating about 75% of all human crop plants, and hives are often transported from field to field across the country throughout the growing season to ensure steady food production. In fact, it’s estimated that honeybees pollinate more than $15 billion in crops each year in the US alone. The loss of bees would have major repercussions beyond the grocery stores, something Chinese orchard owners are experiencing now. In 2013 NPR reported on a region in Central China where the bees had simply failed to show up one spring. Orchard owners scrambled to hire cheap labor to pollinate entire orchards by hand. The result? Harvest increases of 30-40% and an improved economy as new workers paid rent, bought groceries, and participated in their communities in a myriad of other ways. It’s one example of how well humans can adapt and survive without bees – but it’s a small one. Bees are responsible for pollinating 90 different types of key food crops here in the U.S., and cheap labor is a limited resource. It’s a simple answer with far reaching impact – feed the bees! 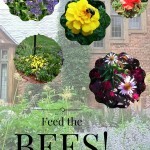 Some of our favorite perennials that feed the bees! One of the biggest problems honey bees face is the lack of plant diversity to be found in today’s modern patchwork of urban sprawl and endless fields. If individual homeowners would agree to plant a few native and ornamental flowering perennials or shrubs into their existing garden or landscape, the end results would be a network of varied food sources that support a balanced, healthy diet for bees. Scientists, farmers, and grocery stores aren’t the only ones working to raise awareness. Nurseries and Garden Centers everywhere are working hard to spread awareness among their clients, and many have gone the extra mile to mark pollinator preferred plants. 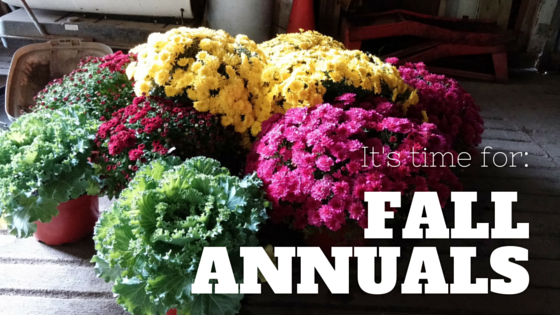 Check with your local garden center staff for plants that will perform best in your area. 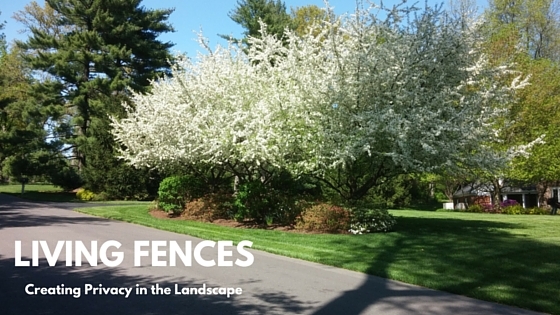 For best results, plant a variety of flowering shrubs, perennials, and annuals to provide a mix of nutrients. Choose plants that will bloom for prolonged periods or create a mixture of plants that bloom at different times of the year to provide continuous feeding. Tip: Avoid spraying chemicals around the home during the hours when bees are active, usually from early morning into dusk. 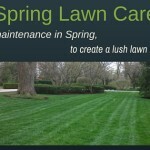 Instead, aim to complete any such projects early in the morning or in the late evening. Questions, comments or Concerns? Stop by our Facebook page – we’d love to hear from you!